Supply chain professionals should monitor the financial health of their suppliers as it can expose their company to revenue and reputational risks. In fact, business continuity can be threatened in the face of financial distress, as affected supply partners will have a diminished capacity to invest in their own operations. When this scenario occurs, a supplier's products and services can suffer in a variety of ways, including: reduced quality, slower delivery, higher prices, and/or lack of availability. In addition, they are often barred from investing in R&D and new product development – the very innovations that increase their value potential. The effort to stay ahead of financial risk is becoming increasingly important in today's highly leveraged business world. By monitoring corporate financial risk, those in the procurement world can more easily identify their riskiest suppliers. These companies may have weak competitive positioning, poor financial health, or, as often happens, both. Financial solvency is an important consideration because a bankruptcy filing by a critical supplier could result in a risk management crisis. While that might be the worst-case scenario, all of the supply chain issues previously mentioned will usually show up well before a bankruptcy. Financially distressed suppliers are more likely to cut corners by limiting spend on product development, technology, their workforce, and infrastructure, among other things. Therefore, the supplier’s product or service itself could deteriorate as well as its support services, including client relationship management and ancillary offerings. Many supply chain and procurement professionals use the CreditRiskMonitor service to accurately monitor the financial health of their supply partners. Subscribers can proactively monitor public and private companies across any industry or geography. 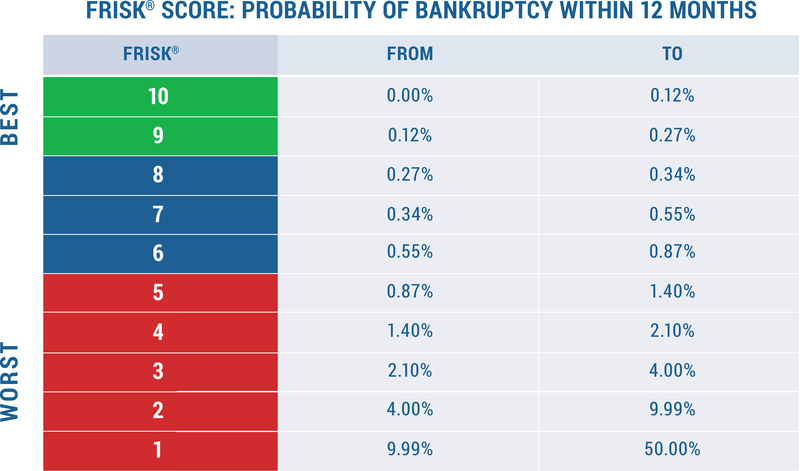 Our proprietary risk scoring models precisely measure financial distress and bankruptcy risk. Between the FRISK® score and PAYCE™ score, total coverage spans more than 40,000 public companies and nearly 80,000 private companies, respectively. With the U.S. economy on an upswing, business sentiment remaining optimistic and the stock market trending near record highs, supply chain professionals who do not subscribe to our services might assume that supplier financial strength is not an important issue. Our subscribers, however, are strongly encouraged to monitor financial risk closely due to how much debt exists in today's corporate credit market. With all of the debt in the credit market today, it becomes clear why corporate supply chains need to be mindful of supplier financial risk. Although things appear to be going smoothly on the surface, this underlying debt situation will be aggravated as the business cycle ages and eventually starts to contract. Corporate supply chains will inevitably run into challenges when this cycle turns lower, as every single cycle has before. Follow the dotted line -- very soon, default rates could skyrocket again. Fortunately, financial risk is a category that can definitely be monitored and mitigated with the right tools. Procurement should be giving extra attention to suppliers that are distressed today, as they will be more exposed to financial and operating risks, especially during an economic downturn. To prepare for this, supply chain managers must incorporate a process for monitoring corporate financial risk. Subscribers that use the CreditRiskMonitor service can identify, assess, and monitor their commercial counterparties, and specifically track critical (or strategic) suppliers to help ensure a resilient supply chain. The best risk mitigation strategies are proactive and not reactive. The CreditRiskMonitor service offers powerful financial risk scores. Both our proprietary FRISK® score and PAYCE™ score each provide: 1) a one-year outlook that is 2) highly accurate and 3) updated on a daily basis. These three primary features help supply chain professionals stay ahead of financial stress and, as a result, potential supplier continuity issues. These are fundamental options to consider when supplier continuity comes into question. We have observed a handful of very large public companies that have adversely impacted many different industries with their insolvency risk. Going down the list, Hanjin Shipping Co., Limited, which was one of the largest cargo transportation companies, filed for Receivership in 2016. Commercial products were halted at sea for a relatively long period, causing supply chain disruptions for numerous businesses worldwide. In 2017, nuclear power construction company Westinghouse Electric Company LLC filed for Chapter 11 bankruptcy. Its financial challenges led to massive costs for utility operators, like SCANA Corporation, and other counterparties. Then in 2018, construction services provider Carillion PLC filed for bankruptcy and actually entered into compulsory liquidation, which has affected a number of businesses that it served. Of course, these are just a few multinational enterprises that ended up landing in corporate failure. With so much junk debt in the credit market right now, there will certainly be more companies, both large and small, that will face severe financial strain in the future. Don’t let it be one of your strategic suppliers. Corporate supply chains need to be wary of suppliers that are financially distressed. High-risk suppliers can expose your company to a variety of issues, which can ultimately have an impact on your company's supply chain, sales revenue and reputation. CreditRiskMonitor subscribers use the service to distinguish between financially strong and weak companies. As financial leverage continues to rise across the aggregate of U.S. corporations, financial risk is becoming an increasingly important issue. In order to manage and handle this category of risk, corporate supply chains and procurement teams need to have a quality process in place. CreditRiskMonitor has the resources that can help.